Tonight, the US National team will face off against China in the quarterfinals of the Women’s World Cup. This matchup reminds us of the 1999 World Cup when the US defeated China in penalty kicks after a scoreless 90 minutes. 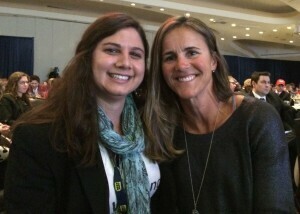 You may remember the iconic photo of legend Brandi Chastain ripping off her shirt in victory once the ball hit the net. I met Brandi a few months ago, and was fortunate enough to track her down to hear her thoughts about this year’s world cup, memories from her soccer days, and tips for staying in shape. Withings: What has been your favorite moment of the World Cup thus far? Chastain: Japan’s second goal against the Netherlands was outstanding. It was a great finish by a great ball handler. Truly what you expect to see in the World Cup. Withings: Who is your favorite player in the tournament? Chastain: Julie Johnston is having such a great tournament. We’ve all been wearing her #19 jersey and celebrating. Plus, we’ve been talking about her for years, so it’s nice that the world gets to see her. Withings: Talk to us about the turf. Chastain: It’s not ideal, and FIFA would never do this to men’s soccer. All things being equal, everyone has to play on it, so that levels the playing field. Withings: Any advice to our users on how to get in shape? Chastain: Interval training is always best. Start by walking for 30 seconds then moving to a brisk pace for thirty seconds and continue to up the pace until you reach, a jog, a trod, and then a sprint. Chastain: How do you stay active as a retired athlete? Brandi: I have a group of close friends who I get together with after we drop our kids off at school. We’ll hit the track for a cardio workout and then head to my garage for weight training. Working out is always fun to do with friends and groups. It’s hard to get started and hard to do it by yourself, other people make it easier. Withings: How has the Activité been working out for you? Chastain: I love it for a couple of reasons: it helped me to become aware of the things a traditional watch didn’t do with its alarm vibration, sleep tracking, and step counting. Plus, it has a beautiful face and I can wear it anywhere. Withings: When we met in February, you spoke briefly about your nonprofit, Bay Area Women’s Sports Initiative (BAWSI), can you tell us more about your work there? Chastain: Julie Foudy (an old teammate) and I founded BAWSI to help girls in under-served communities through exercise with strong role models. We are able to offer programs to empower these girls to achieve their full health, body and soul wellness potential. We started with HS students, and then shifted our focus to a third – fifth grade audience, and took on college students from Stanford and other California schools as mentors. So far, over 16,000 girls have participated. It’s a mutually beneficial project for people who live in depressed communities. We’re able to empower girls who are not typically encouraged to use sports as a vehicle to feel good. These girls in turn become leaders in the classrooms and on the playground. The college students who volunteer have a tremendous power to make an impact in young girls lives that they never anticipated. Thanks to Brandi for sitting down to share some thoughts with us, and good luck to the US Women’s National Team tonight!